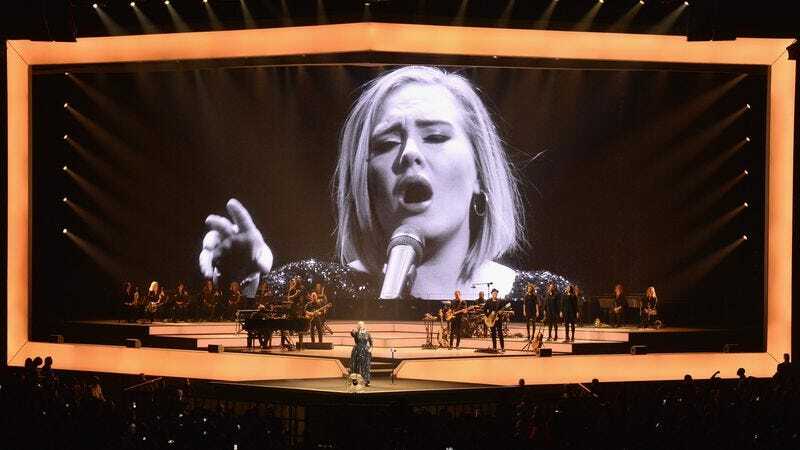 Preeminent balladeer Adele is well versed in the ways of the broken heart, so obviously she had some feelings about yesterday’s news regarding Brad Pitt and Angelina Jolie. (Missed it? They’re divorcing.) According to the Associated Press, the singer dedicated her New York City concert last night to the couple, calling their split “the elephant in the room” and “the end of an era.” She promised “two hours of misery” in honor of the famous couple that was. That the line makes as much fun of her own reputation for making people cry as it does of Brangelina’s end deserves some kudos. She’s also not the only one having fun with this tabloid fodder. London’s Madame Tussaud’s has “separated” the wax versions of Pitt and Jolie, letting creepy Robert Pattison act as a mediator.